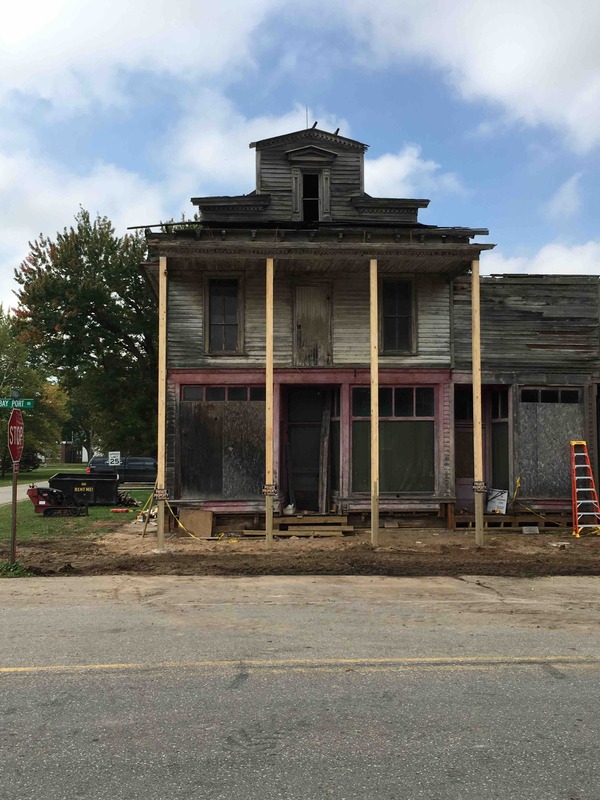 We are working toward restoring the Victorian porch and the facade of the Kilmanagh Store. The store was built in the 1870's, and is starting to show its age. The Building and Zoning Department has deemed the porch unsafe and ordered it repaired or removed. Saving the front is an expensive proposition. It has to be rebuilt to meet current code requirements, starting with new foundations. The existing cement porch deck needs to be removed, and both upper and lower porch decks need to be rebuilt to current standards. The porch roof has pulled away from the wall, and collapsed. The roof deck will need to be opened up, and raised back into position before the roof structure can be jacked back into place. Our goal for phase one is to stabilize the structure, and weatherproof the building. 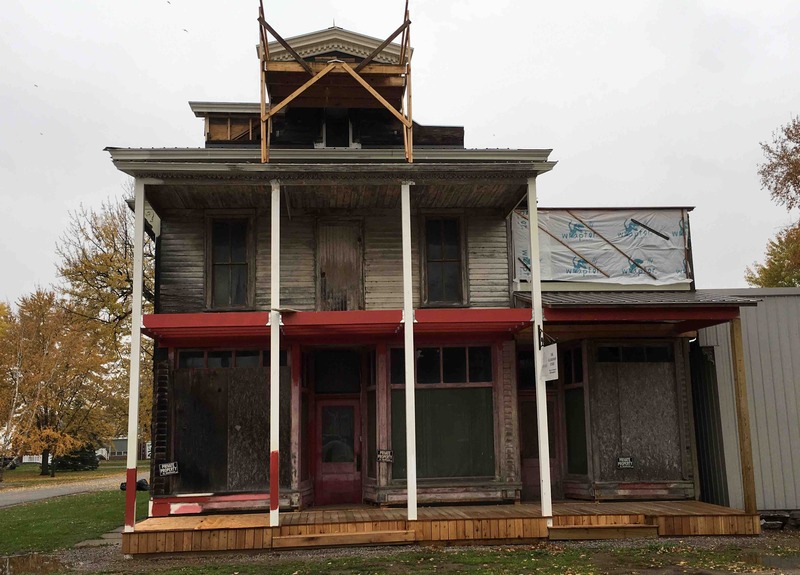 When that is completed, we will work to restore the Victorian detailing on the front, and start to repair siding and windows and paint the other areas of the building. The building is currently owned by Tom and Brenda Voss. It sits on the same land parcel as their house and the adjacent shed. 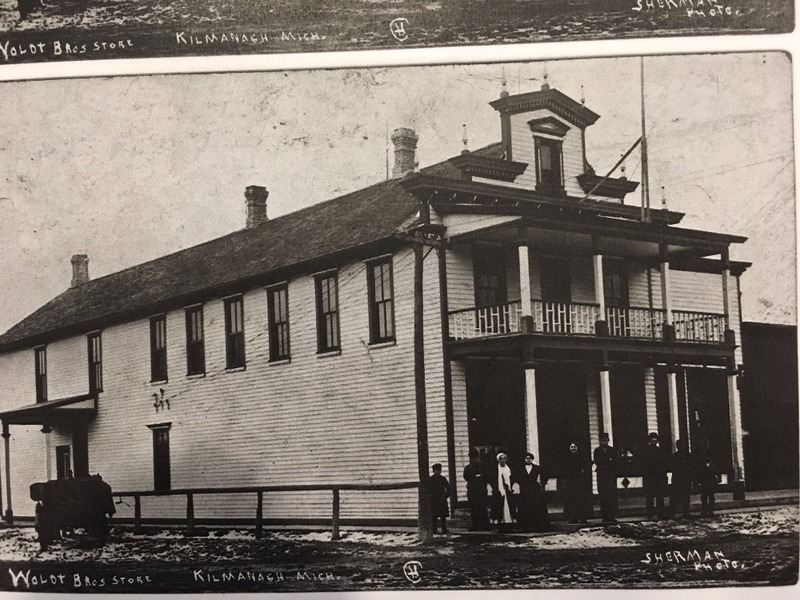 Discussions are currently underway to split the store and shed off into a separate parcel and turn it over to a non-profit entity for the future. Current zoning laws do not support that split. Variances will be required, and the process will take some time, and may not be successful. We made some progress this year, but the cool weather has kind of stalled things. We had hoped for a couple of more warm days to do some painting. The lower porch is pretty much done, but would have liked to get a sealer on it. The upper porch is ready to go down, but that needs to be painted. We should be able to get rest of the cornice up this fall, those are being painted in the shop. The big expenses for next year will be replacing the front windows, and re-siding the south wall. About $30,000 has been spent to date. The outdoor work will be pretty much shut down for the winter. We are pretty much weather tight at this point. There is a lot of shop work to do to rebuild the cornices and porch railing. About $9,200 has been spent to date. The lumber to rebuild the upper and lower deck is about $4,000, the cornice and trim materials will probably be about $2000, and then we have siding and windows, and a lot of paint. We are starting to make some good progress, working around the bottom the walls replacing sill plates and rotted posts. Poured cement for the porch post foundations today. Herzog Construction should be here next week to work on the roofs, and install the new porch posts. Haven't run into any unexpected problems yet.